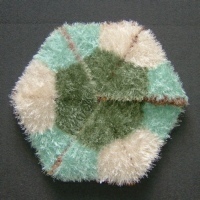 First, it is used as a frisbee (It is quite aerodynamic.) 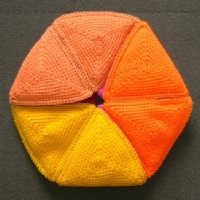 One person will put it on their head and it isn’t long before someone discovers that a slight tug will pull it over the head and it will sit snuggly round the neck, like a ruff. 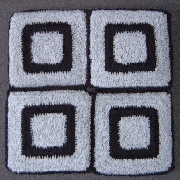 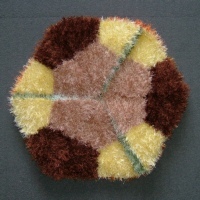 Eventually they investigate its strange properties and discover that this flat cushion has six faces. 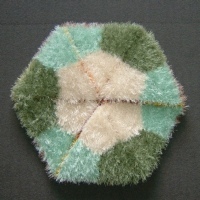 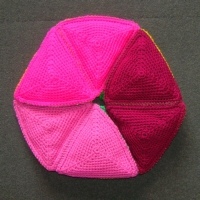 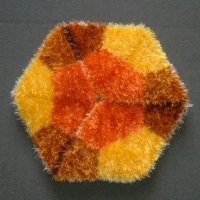 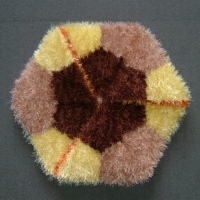 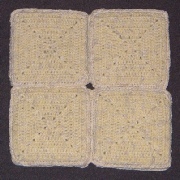 The crochet cushion in the first six photos was made for MathsYear2000 and has been handled by hundreds of people. 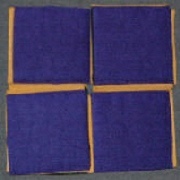 These new photographs show how well it has stood up to this treatment. 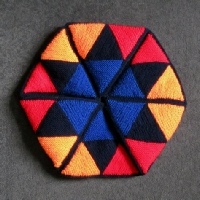 We invented the name Hexaflexacube for this version because the faces were shaded to resemble a cube. 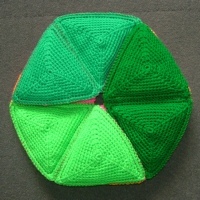 Although the construction is different, there are still six different faces. 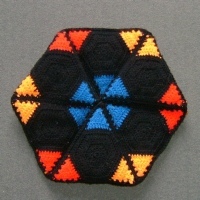 There are obviously three colour combinations but, if you look carefully, you will see that the positions of the colours change. 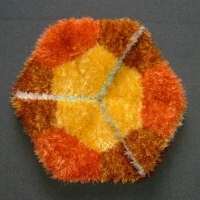 YouTube video showing some of these flexagon cushions. 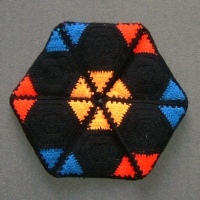 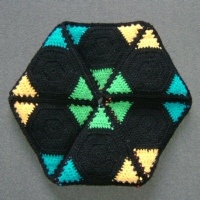 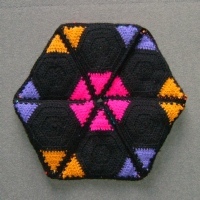 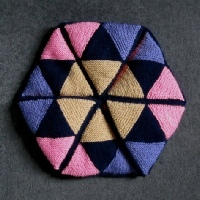 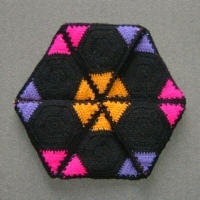 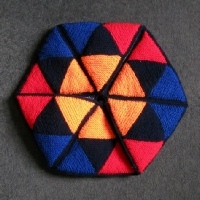 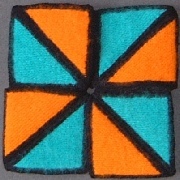 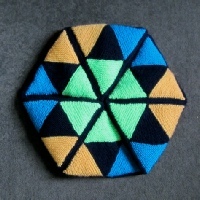 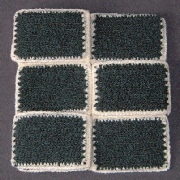 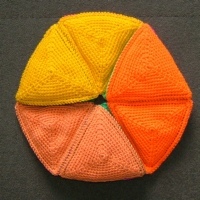 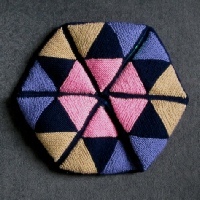 This knitted version was added to the pattern in January 2013. 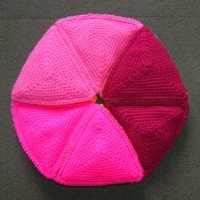 The instructions for these three cushions are included in one pattern. 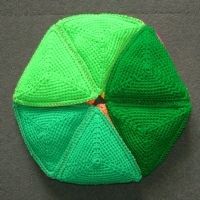 YouTube video showing folding of Hexaflexagon and Hexaflexacube. 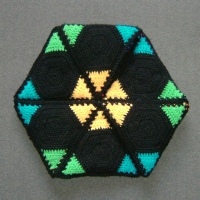 If you have previously bought the pattern you should have received an update at the email address where you originally purchased.